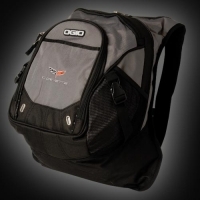 OGIO C6 CORVETTE BACKPACK -HEAVY DUTY CONSTRUCTION FOR YEARS OF USE AND ABUSE. FEATURES DOUBLE LINED ENTRY PACK, INTERNAL PADDED LAPTOP SLEEVE, INTEGRATED SHOULDER HARNESS WITH NEOPRENE GRAB HANDLE. FLEECE LINED TOP DROP-IN AUDIO POCKET WITH HEADPHONE EXIT PORT, SIDE MESH WATER BOTTLE POCKETS AND DUAL SIDE COMPRESSION STRAPS. LAPTOP SLEEVE MEASURES 12.5"H X 10.25"W X 2.5"D. BAG MEASURES 19"H X 12"W X 10"D. EMBROIDERED C6 CORVETTE EMBLEM ON FRONT. COLOR: PETROL. IMPORTED.